I’ll be perfectly honest with you; I’ve never actually done yoga before. All I knew about yoga before I wrote this was what I had seen on TV. I never knew about the spiritual aspect of yoga, or what a community it can build. I was introduced to Tari Prinster, a local New York yoga instructor, and I quickly found out how much more yoga can be. But this wasn’t where Tari drew the line. 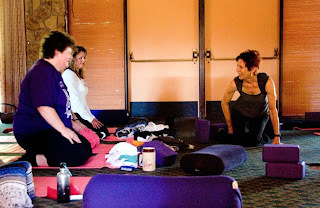 In 2002 she founded Yoga for Women Cancer Survivors at OM Yoga, a program specifically for women cancer survivors. Since 2002 her program has grown from 3-5 women a week to a full 24 classes a week. I asked Tari if she could talk about the before and after class experiences, asking about the community feeling. She said, “they feel safe. And they come for the experience of ‘well-being’ that a yoga class can give. There is nothing in their lives that give them the time and space to just BE. They feel stronger, normal and hopeful.” What started out as just exercise has become something personal, something communal, something giving. So would we consider Tari a “sports star?” I think we can make the analogy that Tari is a head coach, teaching and inspiring, but she has gone farther than modern sport. When something takes the next step; when something takes that step beyond competition; when something takes that step into the realm of helping other people, it goes beyond sport. It goes beyond a combination of fitness and entertainment and it becomes larger. In a time where our athletic role models are only seen in the news for scandals, drugs, crime, contract hold outs, it is refreshing to hear about a woman like Tari. A woman who should be a hero to everyone, sports fan or not.